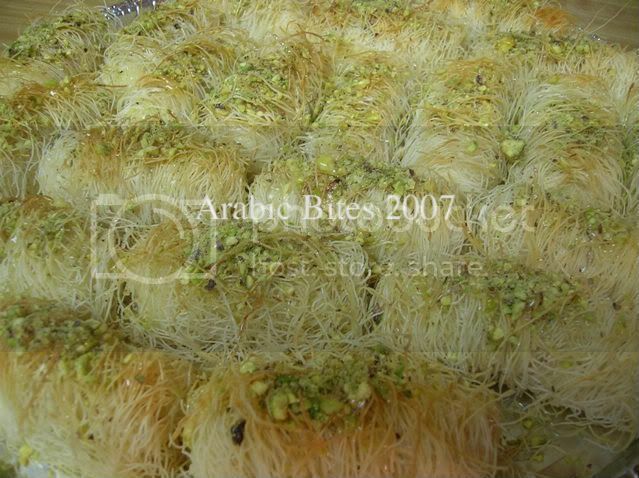 1 package (500 grams) konafa(shredded pastry). 7 Tablespoons corn starch . 1/2 cup Ricotta cheese or Cottage cheese. 1 Tablespoon lemon juice . In a medium pan mix corn starch with milk, add sugar stir constantly over heat until mixture thickens, then add the rose water, vanilla, Ricotta cheese or Cottage cheese, stir. Spoon mixture to a medium bowel, cool, cover, refrigerate until cold. Combine all ingredient in a medium pan, stir over heat, until sugar is dissolved simmer, uncovered without stirring about 15 minutes or until mixture is thickened. 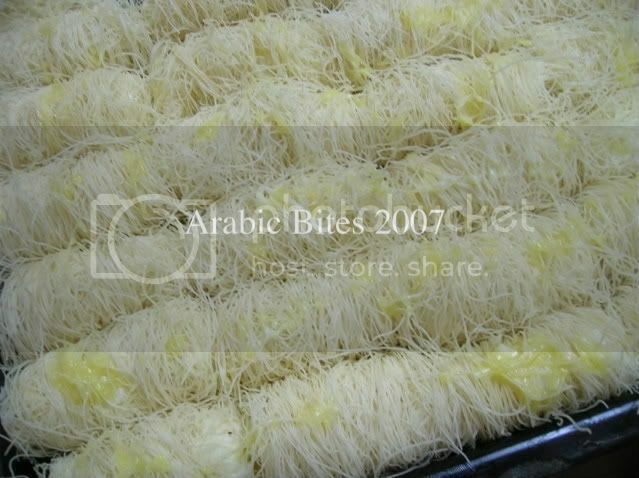 To make konafa finger :Take a small amount of konafa , place filling then roll it . Place on baking sheet , bake in 350 F oven , for 40-50 minutes or until it lightly browned . Let it cool; serve them with syrup and pistachios. This looks so delicious. I just came across your blog from the foodie blogroll and I am SO excited. 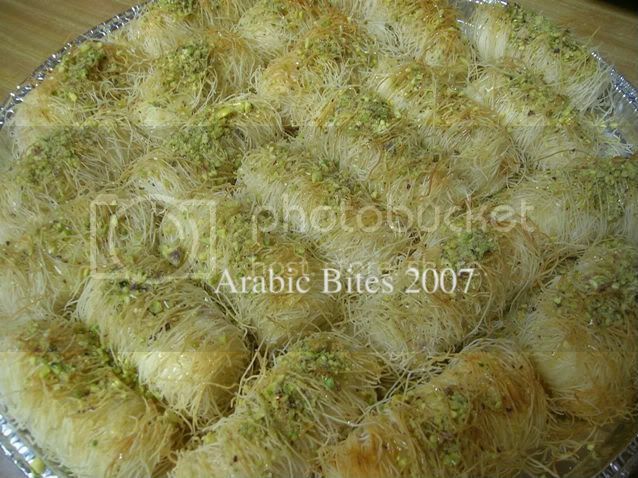 I grew up in a town with a huge Arabic population and I was spoiled with some amazing food. I can't wait to try out some of your recipes! elly thank you for stopping by!I’m glad you like our blog. if you make any of our recipes, let me know what you think. Masha'allah! Beautiful Ramadan treats! In Algeria it's nuts for the filling, I have tried cream once and was interested in trying to make it! Yum, I will today, Insha'allah! Jazak Allahu Khairun! Jamila if you follow the exact filling recipe refrigerate until cold and the ashta will be thicken.if not try to add 1 Tablespoons corn starch . I went ahead and made it following basic pudding recipes and also increasing the starch and milk. I posted it on my site if you would like to take a peak. I prefer the cream to nuts in the middle. Thanks for the cream recipe. Jamila, I think this is why your filling (ashta)is runnier than in my video because you following the basic pudding recipes ,and you end up with different filling what lead you to different konafa flavor. When I started over it came out correctly. I didn't let it boil long enough the first time. The flavor is great! They came out really well. Jamila I'am glad that one of my own recipes work well for you . I just came across your blog. Very interesting. 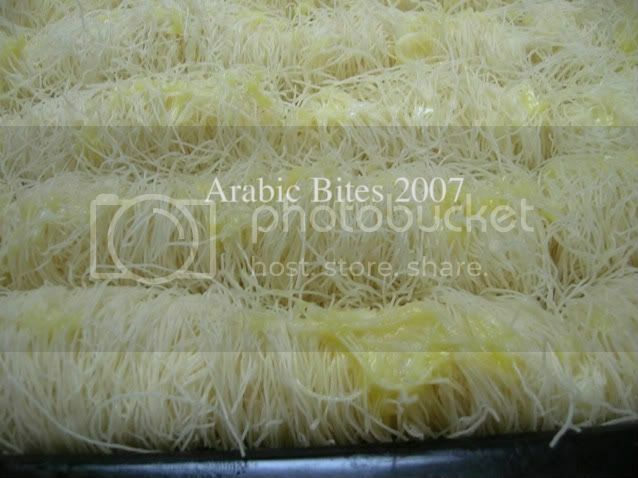 I'm from Malaysia.Is that any other names for konafa?Is konafa the same texture as mee-hoon , here in Malaysia? The recipes looks so yummy. Thank you for the nice comment,& you're very welcome ,if you try any recipes don't forget to tell us what you think. اسمي جوردان من مدينة ميامي. شلون اسوي Konafta in Miami? Can you make it yourself? If you have all the ingredients you can make it yourself. looks delish thank you so much..jzakAllah khair. can I make the konafa shredded pasty by myself? salaam girls! thank you so much for your previous responses much appreciated...i want to know if i can use the same syrup for baqlawa?? and one more thing shira should be hot or cold when pouring on hot baqlawa? You're welcome,I use for baqlawa thin syrup but you can use this syrup recipe it's can be work,shira should be warm & the baqlawa hot. hope this help you,feel free to ask if you have more questions. What a lovely blog. I'll be checking back often. 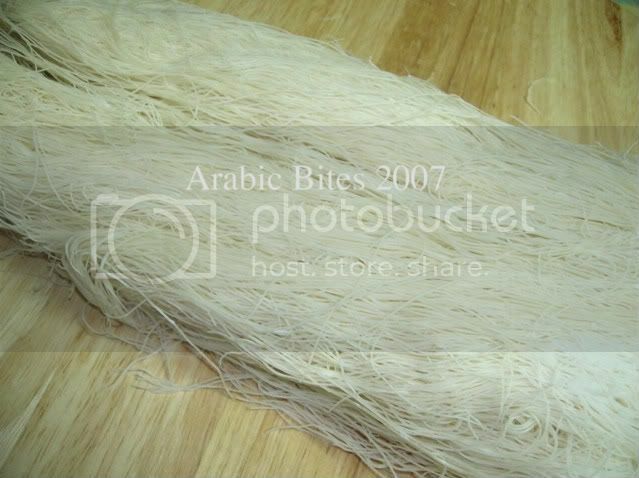 An Egyptian friend uses konafa to wrap around large prawns (shrimp for our US friends!) and deep fries them for a delicious nibble with drinks. 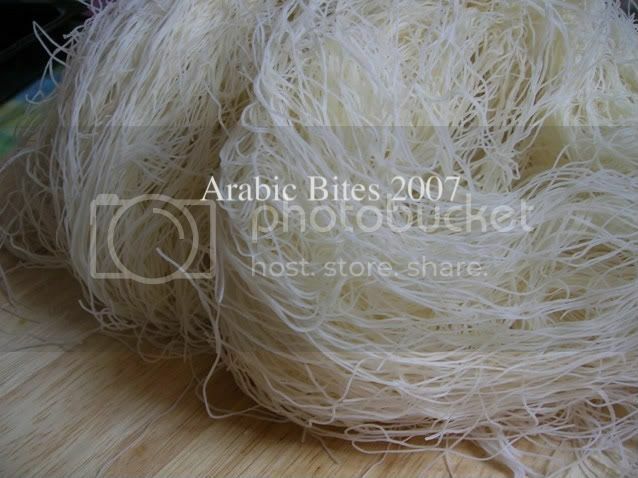 Oh I so happy to have found your blog, I am arab but i have found myself so board witht he same food all the time. I feel like when i ask my husband what he wants for dinner he is shorted because i only know arab food, but your site akes the food i know and kinda updates it so it still the same but a little differnt! My husband can handle that and I'm not board anymore! Thank you! I love Konofa! Yours look delicious! Hi, I'm very happy to came across your blog. Our food cultures have similarity :) We make the recipe too (especially ramadan), We say "künefe", "kadayıf". putting it inside nut or walnut. Really delicious... Have a nice day.